The 2000s till Present – It’s All About the RTR, Rock Crawlers, and Short Course Trucks.. The Future – What is In Store for RC Fans? You might be an RC aficionado and know every model of RC car ever produced, but do you know the history of the hobby? In this article, we will present to you a historical timeline of the hobby starting from the 1960s up to the present. In general, radio controlled cars first hit the UK in the 60s, but they reached the United States in the 70s when small firms like Associated Electrics, Taurus, Delta, and Scorpions started to produce slot cars, which eventually turned to RC cars. First, lets travel back to the 60s – 1966 to be exact. This article below covers the important events throughout the history of RC cars in detail, but if you want to read a a shortened version in an infographic, we created it here. Looking back at the history of RC cars, the first remote-controlled car ever created was the nitro-powered Ferrari 250LM. It was invented by an Italian electronics company known as Elettronica Giocattoli in 1966. A year later, RC cars started being commercially produced by Mardave, a British company based in Leicester. At the same time, other manufacturers such as Model Car Enterprises and WEN also began to make RC car kits. They were called “pan cars.” These cars were 1/8 scale and powered by 2-stroke model airplane engines. In 1968, Elettronica Giocattoli produced another model, the Ferrari P4. The 70s saw the emergence of 1/8th scale nitro powered RC cars. The technology had significantly improved during this time. The engine had moved from a single piston to double. The common engine used back then was the K&B Veco McCoy, and the body was aluminum chassis. The nitro cars used a special blend of oils (e.g. nitrogen, methanol, lubricant). 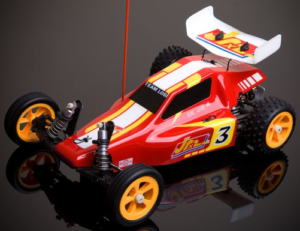 Team Associated, for example, produced its very first RC vehicle, aptly called RC1 in 1971. It was a 1/8 scale nitro-powered on-road pan car. Four years later, the company produced the next model, also a 1/8 scale nitro car, called RC100. The 70s were also the years when electric cars were introduced. These models helped to boost the popularity of the hobby. A Japanese company, Tamiya, produced its first electric on-road RC cars called the Porsche 934 in 1976. This 1/12 scale car was powered by an electric motor that sat on a pan chassis. At the same time, they also produced intricately detailed plastic kits and radio systems, which were rapidly sold. The Porsche 934 was then followed by several other models such as the Ferrari 312T, Tyrrell P34, Toyota Celica, and Lamborghini Countach. All these cars were designed to run on smooth roads. Team Associated followed other manufacturers by releasing the RC12E electric pan car in 1978. It was a 1/12 scale RC car. In 1979, Tamiya introduced off-road buggy cars to the hobby. These models used real suspension systems, powerful motors, textured rubber tires of various sizes and dune buggy body design to allow the cars to be driven on rough terrains. The company released two models – the Rough Rider and Sand Scorcher. The Rough Rider in particular packed a die-cast suspension system and large rubber tires. Today, these two cars can be worth thousands of dollars and are sought by many RC enthusiasts. In the same year, the world’s first 1/18 Scale On-Road Gas Championship was held in Geneva where Phil Booth won the championship. This was also the year that marked the starting of the RC Golden Era. Off-road electric cars had caught the interests of many avid RC fans because the cars were no longer restricted to smooth, paved roads. Other models that were popular during this off-road era were the Tamiya Frog, Hornet, Grasshopper, as well as monster truck models like Blackfoot and Clodbuster. The Golden Era continued until the early 80s. The years of the 80s marked another milestone in the history of RC cars. This is the era where RC cars moved its paradigm from simply scale models to high-performance models. The popularity of RC also skyrocketed during this time. As proof, the 1/12 World Championship was now held every two years and we could see up to 400 racers joining the race! The 1/10 scale off-road RC cars also started to enjoy its popularity during this time. Besides Tamiya, significant numbers of US-based companies started to emerge to produce top-performing RC cars in the 80s. American manufacturers like Associated Electronics, Traxxas, and Losi were some of them. 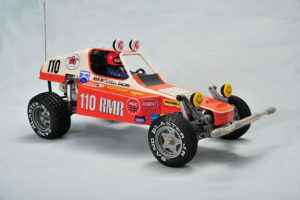 Associated Electronics, for example, produced its award-winning buggy model, RC10 in 1984. It was a high-grade car that featured aircraft-grade aluminum alloy body chassis. It also contained a transmission with adjustable ball differential that allowed the car to tune to any track conditions. This particular model had won the very first IFMAR 1/10 Electric Off-Road Championship in 1985. Associated Electrics had also won the first 1/12 Electric On-Road World Champion three years earlier. In 1985, Tamiya introduced a 4WD buggy called the HotShot. This model was designed to survive slippery and dusty surfaces and claimed to be faster than its 2WD models. Within the next year, more powerful off-road 4WD were released, and they could reach a high speed of 40mph! The year of 1988 witnessed the popularity burst of 4WD off-road RC cars. Some of the top 4WD manufacturers were Kyosho (Japan), Yokomo (Japan) and Schumacher Cat (Europe). In the States, Team Losi soon became one of the fiercest rivals of Team Associated in the American market. The company released its first Team Losi 2WD electric buggy, JRX-2, in 1988. Team Losi continued to produce innovative releases such as the first all-natural rubber tires, the brand-new 1/18 scale Mini-T Off-road Electric cars, and 4WD racing buggy. Besides high-performance off-road buggy and 4WD models, the 80s also saw the emergence of 1/10 electric on-road racing cars. They were very lightweight and could circle oval racing tracks in high speed. In 1989, Team Associated heated up the Associated-Losi rivalry by introducing another great car, the RC10L pan car. This was when the Pan Car On-Road Golden Era started. History had it that Kent Clausen had driven the RC10L at the Encino Velodrome at a staggering speed of 57mph. He later improved his record in the 90s by driving the same model up to 70mph on a bicycle track! The record set by Kent Clausen in the late 80s had given a hint of what to expect in the 90s. It was all about the speed. The 90s saw the birth of a totally new kind of racing called the Superspeedway. 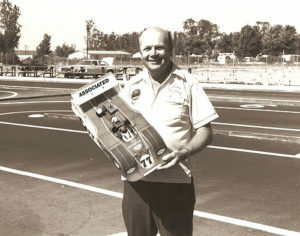 In 1992, the first IFMAR 1/10 Scale Electric On-Road World Championship was held in California. Team Associated continued to produce fast electric pan cars such as RC12LS, RC10LS, and RC10LS0. They all came fully complete with an adjustable Dynamic Strut front suspension and later set the standard for other pan cars. During this time, the cost of the hobby started to increase due to the needs of advanced parts and components. A year later, 1/10 scale electric racing trucks gained its popularity. 1993 saw the transition from bashing monster trucks to fast racing truck models. In 1994, Team Associated released its 1/10 scale gas truck called RC10GT, and Tamiya introduced TR15T. In the same year, HPI entered the RC market by releasing their very first vehicle called the Super F1. Traxxas also introduced its 2WD electric monster truck and stadium truck known as the Stampede and the Rustler. The Touring Car Era achieved its glory in this decade. More and more hobbyists started to take an interest in touring car racing. This was the time when Tamiya’s TA01 and TA02 series became a hit. This type of RC cars is one of the fastest cars in RC and featured realistic and aerodynamic bodies. However, they come at a high price. During this era, manufacturers like Associated, Kyosho, HPI, Losi, Schumacher, Tamiya and many others had produced more than 40 different models. The touring cars continued its popularity until the 2000s. The size of the cars also began to get smaller during this time – from 1/10-scale to 1/12 and eventually to 1/18. HPI released RS4 Mini that had helped to start the minis/micros trend. Also, in the late 90s, gas-powered cars became a hit. Tamiya, for example, released its gas RC car called TG10 Pro. In the same year, American manufacturer, Traxxas, produced its very own RTR (ready-to-run) T-Maxx nitro monster truck. This model had initiated the transition from kits to RTR. The 2000s was the era of rock crawlers and short course trucks. This was also the time when the RC fans started to adopt ready-to-run RC models. Plus, from 2001 until 2011, several acquisition and rebranding efforts occurred. Horizon Hobby bought Losi in 2001 and rebranded the racing team. They are now called Team Losi Racing (TLR). In 2005, Thunder Tiger of Taiwan bought Team Associated. In the same year, the hobby witnessed a change in its radio system technology, from AM/FM to 2.4GHz. During this decade, RC manufacturers have started to use the 2.4GHz modules on their transmitter. 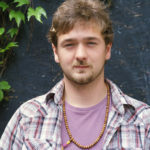 Nomadic pioneered the 2.4GHz application, followed by another company, Spektrum. 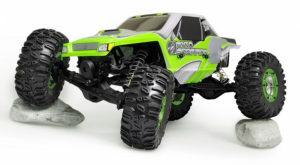 In 2004, the followers of the hobby shifted their attention to rock crawler models. In 2007, Axial released a new rock crawler kit that makes it easy for everyone to build rock crawling vehicles. The model was called AX10 Scorpion. This was the start of rock crawler trend. Four years later, a brand new segment took its course. Traxxas released the famous Slash. It is a 2WD short course truck model that has shifted the RC trends from nitro/gas back to electric. It also put short course truck under the limelight. Numerous numbers of short course trucks were released at that time by manufacturers like Kyosho, HPI, Team Associated, Losi, Durango, and others. The models resembled the look, functions, and proportions of real racing trucks. The most recent innovation in this field is the creation of hydrogen fuel cell hybrid, H-Cell 2.0, in 2010. It is designed to power high-grade RC models. With this hydrogen cell, RC cars can now run longer than the average runtime, up to four times! With the advancements in technology, RC fans can expect better performance regarding speed, controls, and durability. For example, we have seen the introduction of brushless electric motors, lithium-ion batteries, and larger, more powerful engines. These days, the hype might not be as grand as the hype back in the 70s or 80s. However, the hobby still has its loyal followers. They are collecting vintage models and newly released cars still excite them. Regarding the future, we are pretty optimistic. It will not die anytime soon. In the words of a true hobbyist, “this hobby is too much fun to die out.” – and, we agree! Wow this brought back some good memories. I became interested in R/C in spring of 1985 or 86 when I was over at a friend’s house and he had one of the old Tamiya kits and a Futaba Magnum Jr. pistol grip controller. Soon after that I was trying to convince my parents I needed something like that. Can’t remember if it was for my birthday or during the summer I finally got a Marui Hunter and an Airtronics radio setup. By the next year I’d also added a Blackfoot to my collection. Over the next few years I had a few more cars, a JRX2, a Kyosho Lazer ZX4, some kind of Associated onroad car, and eventually one of the RC10’s with their “new” stealth transmission. We moved in the fall of ’91 and I graduated from high school in spring of ’92. I never spent much time with my cars after that. The last time I touched one of them was probably back in about 1994. I think a couple of them are still in my parents basement. Wow awesome story! Get those babies out of their basement and crank em up! Wow I never knew !! Im only 11 yrs old and I am already so into rc! Thanks to this website i figured out that my Father had the Tamiya Grasshopper. So far i have 4 rcs in my collection got a 1/12 sct from feiyue , you prabably never heard of it since its a pretty cheap rc , I also have 2 1/14 rc drift cars and A Exceed 1/16 dune buggy , i was thinking on my birthday to get a Traxxas Slash4x4 and a Tamiya Grasshopper kit for my dad on christmas!! Wow very cool! Sounds like a great plan! I’m looking to get my boyfriend a rc car kit for Christmas but I have no idea what to get and could really use some advice! I recently learned that he and his dad enjoyed building and driving rc cars when he was a kid in the early 80s. Any recommendations on a good kit ideally under $200? How exciting Katie! Are you looking to buy him a pre-built RC car that comes ready to drive right out of the box? Or are you looking for an actual kit so he can build his own? Hi , I’m looking for history of any footage or photos including my dad who won the British champion in 1984 at chesterfield , racing 1/10 scale off road team associated can you help? Sorry Mark, I don’t know where you could find footage or photos of that, but I’m sure he would be very happy to see them if you could! Sorry Anthony, I don’t have any idea, but hopefully someone here does! Remote Controlled Cars are amazing things for kids and even to someone like me an adult, it is a playing game for me. I love to have the experience I do have while on real cars while playing with remote controlled cars. I know what you mean! There’s no better feeling! I was 20 years old in 1984 when I purchased my first rc, a Tamiya frog. Had been out of RC until 3 years ago when I went to a bike track, where people had gathered to run their rc trucks. Boy o boy was I impressed. Within two weeks I had a brand new RC truck. Within 6 months I had 11 trucks. Today that number has dwindled to 8 RTR, including the X-Maxx, Arrma Kraton V2, 4×4 Slash, 2 2wd Slash, Losi Strike SCT, XTM X-C & XTM Rage 1/18. My LHS is called Hooked Hobby, and I am definitely hooked, more so than many years ago, but it is a great hobby to enjoy by yourself, With Friends or family. BASH ON RC BROTHERS & SISTERS. Love it Brad! I’m glad you got back into the hobby! I’m hooked too! Hi to all the rc fans out there, my situation is alot like Brad’s. In 1994 I bought a used rc10gt and fell in love with rc cars & trucks. Shortly after I got the rc10gt I totaled it, a radio glitch. I got out of it & just got back into it a month ago and I’ve got 2 complete rc10gt’s and 2 mostly complete trucks and a bunch a parts. Awesome James! Glad to see you’re back in the fun! I was heavy into the hobbie in the late 90s and early 2000s racing stadium trucks on clay tracks and over the years ive had nitro cars and trucks im kinda getting back into playing with after a 1/18 scale cough my eye on ebay lol ive ordered 4 old used 1/18 scale cars m trucks but the more i look for parts and information about them it seems the racing side of rc vehicles had all but vanished almost all the 1/18 scale vehicles have been discontinued and not replaced with anything almost all the hobbie shops in my area of az have closed so have the tracks indoor and outdoor … is it just me or is it like this in many areas? Yep unfortunately the hobby seems to be dying off slowly! It will never go away, but it seems like kids these days would rather just play video games. That, and you can order just about everything you want online. Hello to all RC fans. I’m looking for a F1 RC model# S0516 battery speck. Anyone who can assist me, it will be greatly appreciated, thanks 🙏 I lost my battery and need a replacement. 2600mAh 12v 7c.c. 49 MHz.